Did you know that Drones are now playing a huge part in the Agricultural/Farming industry. Now is a great time to get in and sell the services of a world leader in this technology! This is the perfect opportunity for self-employed sales agents looking for opportunities to sell within the Agricultural industry or to farm owners. Alternatively, if you are involved in the agricultural business and have an interest in using this service, please contact Ryan@commissioncrowd.com and i'll be more than happy to introduce you to the owner of the company. 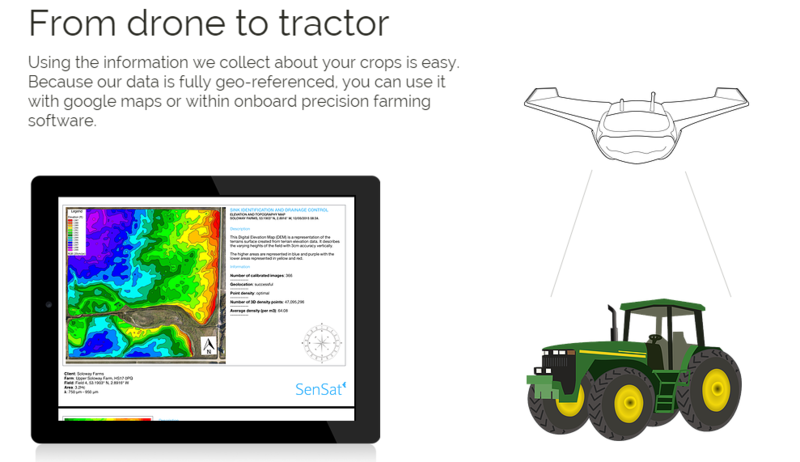 SenSat are a pioneering company run by founder - James Dean - which offer Farmers the latest in intelligent crop monitoring services using drones and high tech mapping technology. Because many farms still operate with crop yields that barely exceed the break even point. To meet liabilities, many farmers are now looking to new technology to offer insight and guidance on how best to tend to their crops. Many farmers already understand the advantages of intelligent crop monitoring, not only as an after-thought, but as a main element of their crop growth strategy. This company are at the very forefront of the shift in technology advancements within the Agricultural industry. Our company provides technology for the mass monitoring of crops at an individual plant level to offer farmers a real time health analysis of their crops. This helps farmers identify problems, such as water stress, disease or pests, before they can be detected by the human eye. My name is James Dean and i'm the founder of SenSat. I graduated from King's College London with a Bsc (hons) in Geography and a minor in Astrophysics from The University of California, Irvine. My specialty resides in Satellite Sensing and Earth monitoring where I worked with NASA's LandSAT and MODIS satellites. In addition I've worked collaboratively with professors from NASA's Jet Propulsion Laboratory. Where did the inspiration for your company come from? I have a background in satellite remote sensing and remember the time I first encountered it and thought how useful it was. Fast forward a few years and to a conversation I was having with a friend, showing him a short video I had just shot with a drone. He asked me if there were any commercial prospects for this technology and I realised that yes there were commercial aspects, but more importantly an opportunity existed to radically improve the way we grow our food. For the first time drones can capture amazingly high resolution imagery, doing the job of a satellite but better. largely preventable, it really made sense to develop and implement this technology. Why is intelligent crop monitoring important for the future of Agriculture? We are already entering a new paradigm in the way we manage crops. It is hard to grasp just how revolutionary the ability to understand intricate plant health on a mass scale is. For the first time farmers can see their management practices and adjust them accordingly based on data not hunches. There will also be greater attention paid to Agriculture's environmental impact, and blanket pesticide spraying will not be allowed to continue. Intelligent Crop Monitoring unlocks knowledge for farmers in where they need to place chemicals to both save them money and environmental damage. This means that we can make food production more efficient and grow more with less. In times of increased demand and enhanced resource strain, this can only be a good thing. Can you give us an insight into the industries and customers you serve? We are geared up to work with farmers of all sizes to make the benefits of agricultural drone remote sensing accessible. Our drones now provide access to resolutions far greater than are possible by satellites and I like to use this analogy; if you are a financial stock manager your job is to know and understand the exact performance of every single stick within your portfolio so that you can make the best decisions in order to grow your investment portfolio. Likewise, a farmer's crops are his livelihood, his portfolio. It therefore makes sense for him to understand the intricate health of all of his crops so that he can make the best decisions to return the highest possible yield. the benefits of our technology to help them make real improvements on their farm. 2. Affordable. We have managed to reduce the cost of service to a fraction of the commodity price per hectare.his price is derived in part from expected market prices for certain crop commodities to ensure that the yield boost from SenSat monitoring creates a greater economic gain than the price of the service. This is our commitment to sustainable growth, both organic and economical. 3. Economically viable. It must, without doubt, provide a commercial benefit to farmers. Our service now costs roughly SenSat 0.5% of yield, and studies show an average boost of around 6%. This, I believe, is a healthy ratio and value add to farms. What makes your company unique and why should self-employed sales agents choose to work with you? advancements to solve real world agricultural problems. We do not exist solely to make money, as money is simply a by-product of delivering something truly beneficial to the industry and customers we serve. Self-employed (commission-only) sales agents wishing to connect with us are getting in at an exciting time, just as the industry is starting to shift and adopt innovative technology like ours to increase their crop yield and overall ROI on using our services. We also believe that what we do can bring about positive change and help a lot of people at the same time. We are a pro-actively ethical company and dedicate 20% of our commercial profits to support SenSat sustainable, our charitable arm that puts our technology to use in helping developing world farmers spot crop problems before they become critical. Each year 504 million tonnes of food crops are lost to drought, disease and pests and we feel a certain responsibility toward this as people in a position to help. What's the vision for the future of agricultural drone crop monitoring technology? This is where it gets truly exciting. The world resources institute predicts that we will need to grow 60% more food by 2050 in order to meet the needs of the planet’s growing population. At the same time, strains on natural resources will mean we need to produce more with less. But perhaps the question should be rephrased to how quickly can the world change? I believe the answer is very quickly. Ray Kurzweil, author and Director of Engineering at Google believes that the 21st century will achieve 1,000 times the progress of the 20th. We have a largely warped reality of the food chain. In the developed world we think and talk about food in idyllic regard, the concept of food insecurity is yet to capture our full attention. There is no doubt that a combination of population growth, climate transitions, misguided government policies and the growing inequalities in global wealth will create a future perfect storm; the question is when. The response is simple. It's about sustainable intensification; the ability to produce more with less, to monitor precious water resources, to carefully manage our land and apply science and technology to our problems. The answer lies in innovation. We aim to apply the breakthroughs of computer electronics and use them to solve real world problems; sustainable farming and world hunger. In the future drones will fly autonomously from centralised hubs to collect farm data, then return to their base, processing data in flight. NASA have been working to develop a consistent regulatory framework for managing the airspace above our heads. The project is called the Unmanned Aerial Vehicle Traffic Management System (UTM) which is based on the operator classifications for airspace as outlined by the International Civil Aviation Organisation (ICAO). The UTM is focussed on class G airspace, generally defined as below 1,200 ft above ground level, because drone operations should be contained to low altitude. In addition the UTM accounts for drone specific features of air design, such as separation management, scheduling, demand capacity, contingency management, trajectory definition and weather integration as drones fly lower and slower, they are more susceptible to wind. A particular benefit of autonomous drone flight is the ability to embed geo-fencing, where areas are defined by GPS coordinates and all movements and behaviours of the vehicle can be closely tracked by operators. The feature allows drones to have specified no-go areas, for example around sky-scrapers or pylons, as well as drone-to-drone detection mitigating in air collisions and communicating interference events such as gusts of wind. The UTM will need to be incredibly precise, and that kind of precision will make it incredibly safe. On the other side of the equation is battery life and the question of how to power a full day of autonomous flight? There was a time during the early development of portable electronics when the biggest hurdle to overcome was making the device small enough to be considered portable. After the invention of the microprocessor in the early 1970s, miniature, portable electronics have become commonplace and ever since the next challenge has been finding an equally small and reliable power source. MIT researchers have reported that an advanced manufacturing approach for lithium-ion batteries (the most widely used type of rechargeable batteries) promises to significantly slash the cost whilst improving their performance. This has profound implications on two fronts; firstly it reduces further the cost of production which inversely increases the accessibility and uptake of the technology. Secondly it makes day long flight between charges a real possibility.